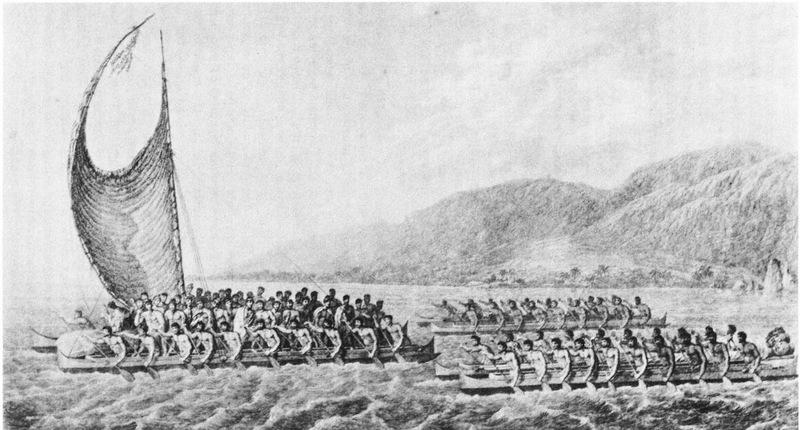 Two types of boats were prevalent in pre-European-contact Hawaii: the single-outrigger canoe and the twin-hull, or double, canoe. Outrigger canoes were far more numerous, performing most everyday functions such as fishing, personal transportation, and local trade. The larger, more expensive double canoes were owned by the social elite and were used for war, ceremony, deep-sea voyaging for larger-scale missions of trade or exploration, and to display the owner's prestige. An average-size double canoe of the mid-19th century was about 48 feet (14 m) long and 6'7" (2 m) in beam, with each hull being about 1'7" (0.5 m) wide. Far larger ones existed, though: Capt. 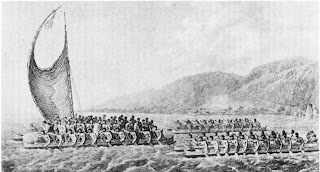 James Cook's third voyage to Hawaii (1776-80) reported the largest as being 70' LOA with a 12' beam. The longest ever recorded was 108' LOA: since all double-canoe hulls were carved, dugout-style, from single trunks, this would have required a pair of extraordinary trees. Complements of several dozen were probably typical, although crews as large as 120-140 men were reported. 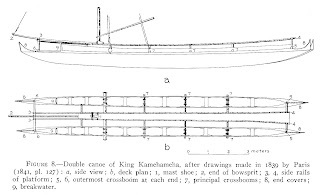 King Kamehameha's canoe, from a drawing by Admiral Paris. Note six full cross-booms, a partial boom at the forward end of the platform, the mast step (which does not sit atop a cross-boom), and the bowsprit. 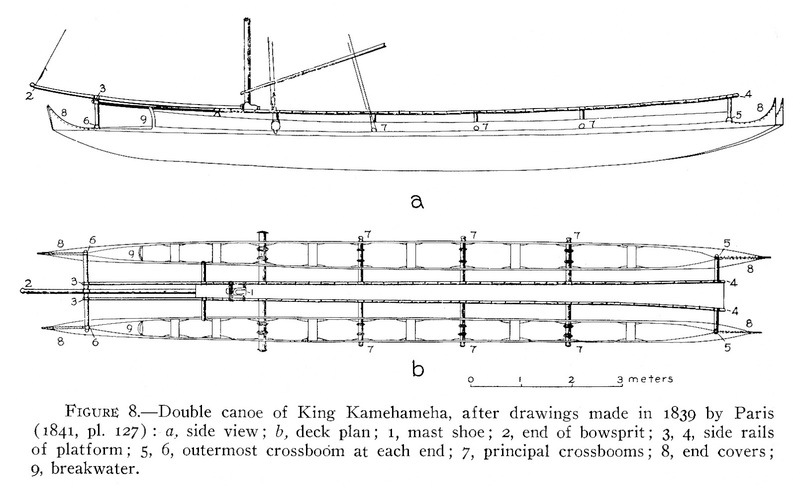 Compared to modern twin-hull vessels, Hawaiian double canoes were quite narrow, with a typical length:width ratio of 7.2:1 or 7.3:1. By keeping the hulls close and the cross-booms between them short, wracking forces that would tend to break the structure apart were minimized. A cargo platform, which was fastened to the cross-booms between the hulls, was necessarily narrow, restricting the canoe's carrying capacity. In the average-size canoe mentioned above, the platform was a bit over 32' (10.4 m) long and averaged only about 1'7" (0.5 m) wide. Although the distance between the hulls was about 3' (0.9 m), the platform could not span that entire width: space had to be left between each hull and the platform so that the crew could paddle on the inboard sides of the hulls. A cross-section of an almond-shaped hull. 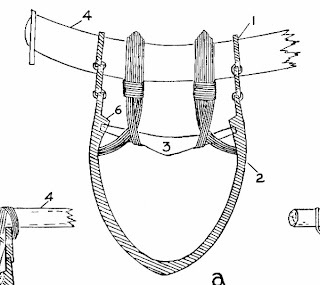 The cross-brace (3) is held in sockets on the inside of the hull, and provides an anchor for the heavy lashings that secure the cross-boom (4). (The lashings are poorly drawn: it's impossible to tell how they terminate or where their lower ends lead.) This boat is unusual in having two washstrakes. The hulls were most often carved from native koa, a.k.a. Hawaiian mahogany (Acacia koa), although Oregon pine, which occasionally showed up as driftwood, was used to make the largest boats. The hulls were symmetrical and as close in size and shape to one another as possible. On most hulls, the sides were usually fairly straight, transitioning rather quickly at the bilge to a rounded bottom, although some hulls had a somewhat almond-shaped cross section. During carving, cleats were left standing proud some inches below the top edge of the dugout hull to serve as fastening points for spreaders, which served mainly to anchor the lashings for the cross-booms. 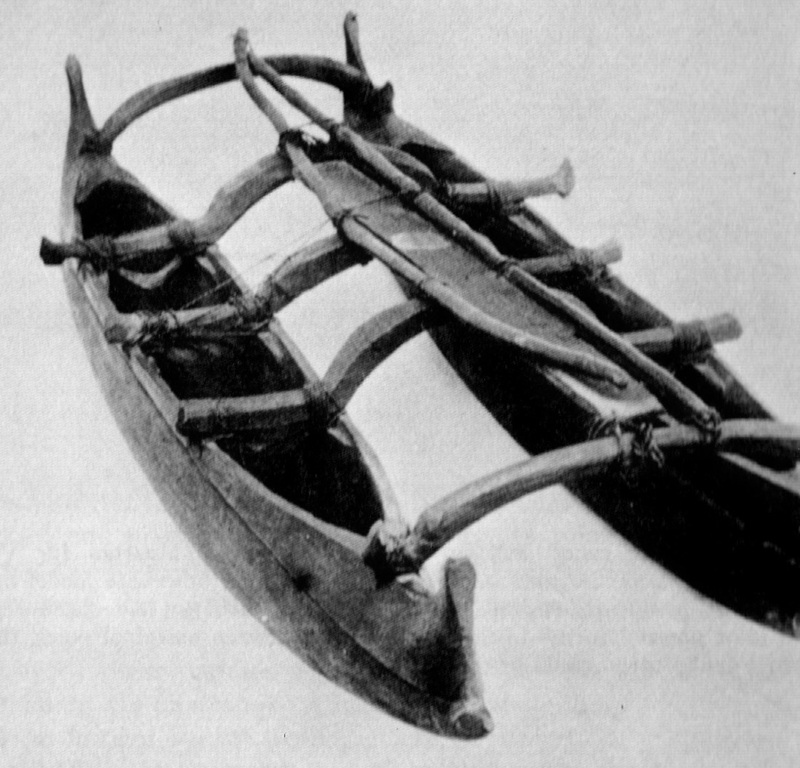 The fairly rough model shows the double-curved cross-booms that were typical of later canoes. Compare to the straight cross-booms in the line drawing above. The booms, which ranged in number from as few as 3 to probably more than 6 for the largest boats, rested atop the upper edge of the dugout hull and passed through the bottom edge of washstrakes, which raised freeboard by several inches. 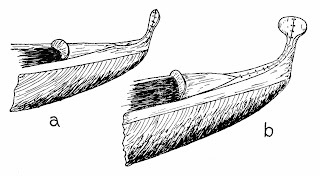 Older canoe examples mostly show straight cross-booms, with later ones having booms that curve upward amidships, raising the cargo platform higher above the water. These double-curved timbers were gotten from branches of the hau tree (Hibiscus tiliaceus). A double-rabbeted joint between the hull (b) and the washstrake (a:). The exterior of the hull is at the bottom of the illustration. The sennit lashing (c) is almost entirely protected on the exterior. The lower edge of the washstrake was rabbeted to fit over the upper edge of the base (i.e., the gunwale surface of the dugout hull), with the outer edge of the washstrake extending a bit wide of the base. Sometimes the upper edge of the base was also rabbeted. Lashings of sennit held the washstrakes to the base, with holes bored so that very little of the lashing was exposed on the exterior. Elaborately carved end-pieces extended the washstrakes on each side and curved into the horizontal to form end-decks. The smaller spatulate terminal in (a) was typical of most double canoes; the larger device in (b) was more prestigious. The washstrakes were cut off square at the ends. They were continued into the ends of the hulls by carefully-carved pieces that transitioned from the vertical into the horizontal plane to serve as end-decks and ended in vertical, spatulate terminals. The two mirror-image pieces which closed in each end were lashed together along the hull's centerline. 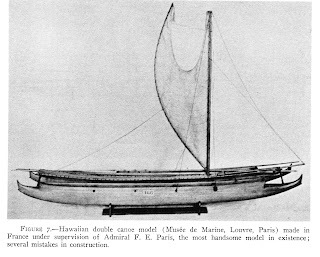 This model was made under Admiral Paris's supervision, but according to Haddon and Hornell, it contains several mistakes. Note the straight cross-booms, "ram" ends that extend beyond the washstrakes (unlike the line drawing); rigging details of forestay, shrouds, mainsheet, and a line bending the upper end of the sprit toward the masthead. A single, fixed mast was stepped on the center platform, and while it would have been stronger to place it directly above a cross-boom, this was not always done. (Some early reports stated that the mast was stepped in one of the hulls, but this was apparently not the norm. It may have been an expedient when two single-hull canoes where fastened together to form a temporary double canoe.) The boom – really a sprit – was fastened at a sharp upward angle near the base of the mast, and a cord was used to bend its upper end in toward the masthead. Masts were supported by backstays, shrouds and, in at least some cases, by a forestay to a short bowsprit. A single sheet was fastened about mid-way up the sprit. 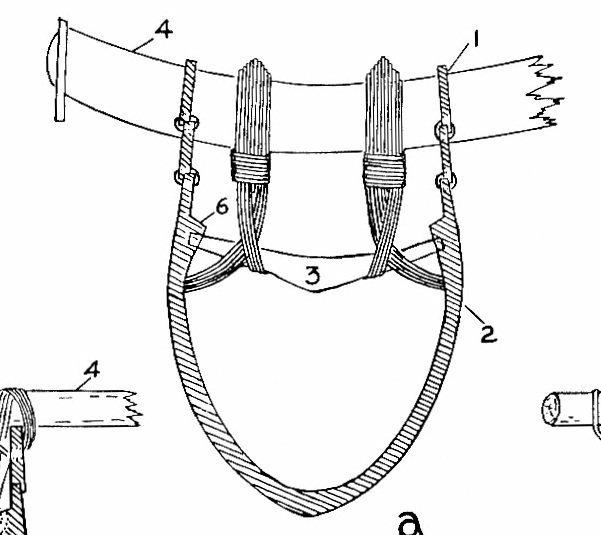 The sail had a crab-claw shape and was made of woven matting. Lengths of matting were also used to cover the hulls in rough weather, with holes left for the paddlers, who sat on thwarts. Paddling was the preferred form of propulsion in almost all circumstances: indeed, with the mast stepped so far forward, sailing would have been problematic in any but a downwind direction. Propulsion paddles, carved from single pieces of koa, were about 5' (1.5 m) long, with large blades and no grip. Steering paddles were substantially bigger in all dimensions and had a T-grip. All paddlers in each hull paddled on the same side. A rapid pace was maintained, and on a signal from a "stroke" paddler in the bow (three raps with his paddle against the hull), all paddlers would switch sides. 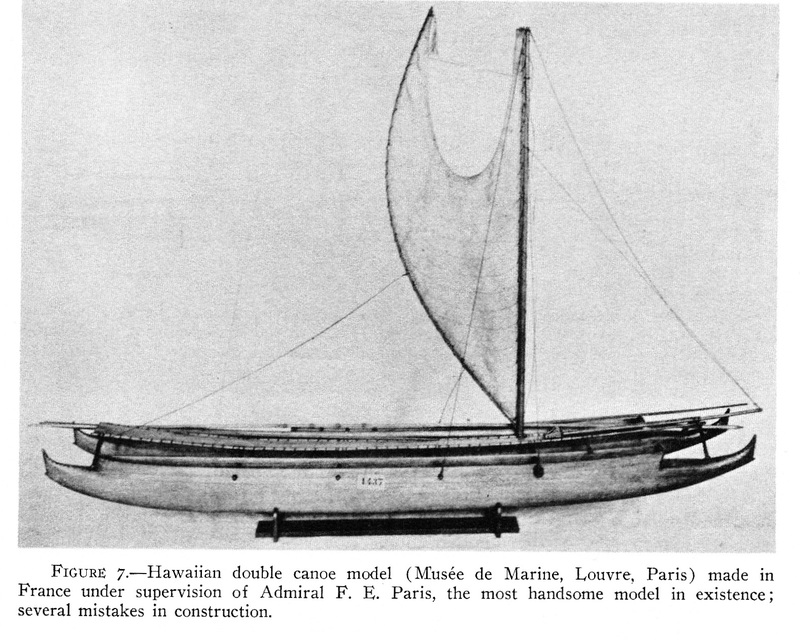 For more on Hawaiian double canoes, see our previous post on the reproduction voyaging canoe Hokule'a. I've written before about the Dover Bronze Age Boat. This is my favorite ancient boat, mainly because I was among the first journalists on the scene, and it is the only marine archaeological excavation that I have experienced up close (an experience which filled me with awe). The replica of the boat that has been under construction (which I reported here as being a full-size reproduction, but which was, in fact, built at half-size) is now essentially complete, except that it doesn't float. As shown in the Kickstarter video, the replica's sponsors now plan to disassemble, caulk, and reassemble the boat in water-tight condition, and then to campaign it along England's south coast. The video shows parts of the boat in fine detail, including some provocative internal X-frames. I'd like to know the evidence or the reasoning behind this unusual feature. Also of interest, but unfortunately not shown, is the archaeologists' interpretation of the unusual yoke-shaped feature on the upper side of the bottom's bow end, and how it fit together with other planks in closing in the bow. I've also written previously about the replica Ferriby Boats. Also from Britain's Bronze Age, the Ferriby boats exhibit a similar technological approach but different engineering solutions to the problems of edge-joining and waterproofing the joints between heavy hewn planks. It would be interesting to test Ferriby and a full-size Dover replica side by side and compare their capabilities.